The love Susan Prinsloo* of Pretoria found on a mate-finding website left a bitter (and expensive) taste in her mouth when a man allegedly tricked her out of her money. The love Susan Price* of Pretoria found on a dating site left a bitter (and expensive) taste in her mouth when a man allegedly tricked her out of her money. Someone with whom she thought she’d eventually found love again managed to get R90 000 out of her and allegedly vanished with it. Susan (52), a mom of two sons and a widow for the past eight years, joined a website for singles in 2015, hoping to meet a mate. 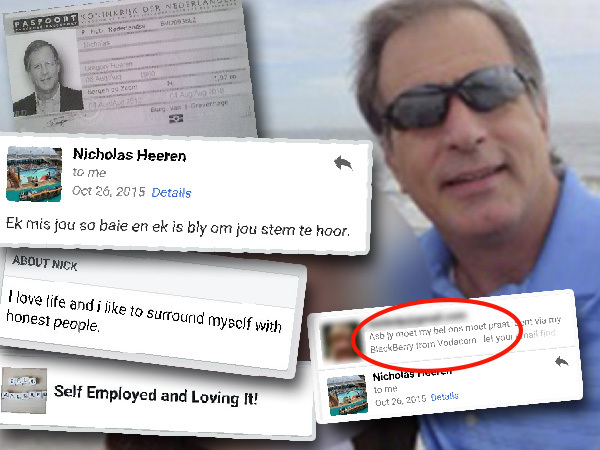 “I met Nick Heeren (56), an architect from Amsterdam, Holland, who had moved to Cape Town.” Nick allegedly told her he was a widower and that he had a daughter living in Canada and attending a mission school. Susan believed him. His profile on social media seemed “very decent” and “sincere”. “Nick’s words flowed like syrup. He said he was deeply religious and that he knew I was just right for him, the woman he wanted to spend the rest of his life with,” Susan says. Although the couple corresponded for more than six months they hadn’t met. “He was to have visited me in Pretoria and I searched for a guest house for him.” But the plans were never realised. Susan says she’s religious and believed that if Nick was meant for her she should help him. So she borrowed money from her bank and paid it into a Canadian account. But then Nick allegedly told Susan there were problems with his credit card, which had expired, and he couldn’t come back to South Africa. He would need another R40 000. “Nick sent me the contact details of Direct Axis and told me to contact him as soon as I had taken out a loan. “I borrowed R40 000 and paid it into the same account.” After that Susan didn’t hear any more from Nick and couldn’t trace him on Facebook. Now Susan has to pay R5 000 a month from her pension to pay off the two loans. She has tried to trace Nick but without success. “I can’t believe I was so stupid. It was my own stupidity,” she says.